Please DO NOT upgrade my interface unless I want it to be. I am tired of the interface being dumbed down and your developers “fixing” what isn’t even broken until it is. It seems rather counterproductive for those of us who have been at it for a while. This post started with the intention to give those who call ourselves Kemetic a place to look to find resources. I know that I am not the first to talk about this. Certainly Devo Kraemer with the Kemetic Round Table and her blog, as well as Helmsman of Yinepu, Henadology and countless others have stated the same goal. This post is to essentially open up the dialogue and throw out ideas to the greater Kemetic Community as a very small piece of a much grander puzzle. If we can just figure out where we are going, we might end up getting something that has a bit less in fighting and is a bit more cohesive. All of we Kemetic folk are different. We come from different places, have had different sebau (teachers) It feels a little bit like that road sign on the set of M*A*S*H* that showed where everyone at the 4077th where home was. 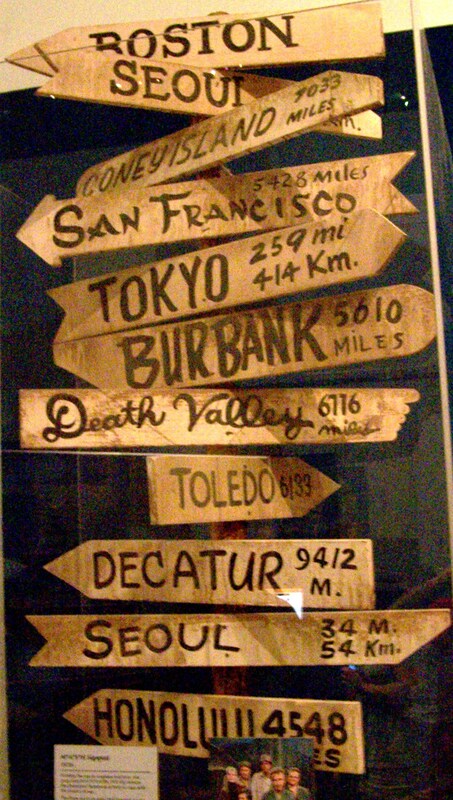 The road sign served as a starting place, rather a map of how to get there. More than simply telling someone that there is just one temple, one group or one single right way to get to where to go, it will, I hope that something like this might serve more people without any accusations of an agenda. The truth of the matter is that civilization was born in Kemet. The pharaohs were black, and varying degrees of brown and every other skin colour that was known in the ancient world at the time. This is inevitably what happens in an integrated and cosmopolitan society. By my saying this, it does not make me a revisionist or a racist. Speaking only for myself, my goal is to welcome any and all evidence and discussion, except that which promotes racial hatred and modern cultural divisions that seem to have escalated to all time highs over the last few years. Like most within the pagan and polytheist sphere, we Kemetics have our share of issues to deal with. We have our dramas and disagreements but overall, I don’t believe it’s anything that cannot be overcome. So…..we can choose to continue to arguments over religious doctrine or other points of contention, or point fingers about who “stole” what from whomever else, or we can acknowledge the fact that for each or us Kemet is a constant call in our lives. Just as in Kemet’s antiquity, I believe that cultural exchanges and sharing were and are the norm. Someone who was well-traveled or could appreciate the customs of the people and places that they visited was welcome as a guest and greeted as a hero or heroine when they returned home to share the knowledge that their travels had afforded them. Being a good, respectful guest was the most important thing of all. I think the akhu (ancestors) have plenty to teach us on many levels and it is something that the world desperately needs. I believe that we can have that and be the richer even if all we do is try. We are most us here because we love Netjer or the Netjeru and honoring the akhu. The land of Kemet IS Zep Tepi, the First Time. It is inevitable that it calls to our kas with such depth and intensity that we cannot turn away – not even if we wanted to. But what about Kemet is it that calls us? Is it the sophistication of design? Is it the fact that science and medicine, literature and the beginnings of writing were born on the banks of the Nile? What do we as modern, 21st century people hope to gain by reviving the religion, the culture and the values of that bygone time? I believe for everyone the answer is different. Even as a child, I dreamed of a day when more people would realize how wonderful ancient Kemet was and there would be a push to restore temples and bring a language back from the Realm of the Dead. With the advances in Egyptology and the push to reconstruct events, study DNA and analyze the overwhelming amount of data coming out of Egypt on an almost daily basis, we may very well see some of these ideas and pushes become a reality. 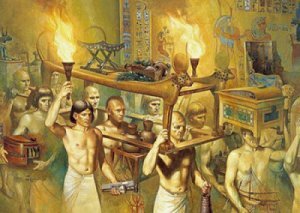 What I want, what I am asking in this blog entry is for people to think long and hard about what it is in Kemet that draws them so deeply. I sincerely want to hear from each and every one of you – not because I am starting a new group; but rather because it’s something I’ve felt called to ask and to do. I am not doing this for any group, even though I am currently a member of a group. I respect and care for enough people outside of my own respective group and have the luxury of conversing with them in a dialogue of mutual respect. It is of paramount importance to me that this spirit of cooperation continues. For some, such as myself, Kemet was a call felt at a very young age that simply would not let go. For others, it is a reconnection to their own proud history and culture. For others, it might be something else entirely. Whatever it is – it’s important. It is my hope that the dialogue between all of the different groups can somehow push us a little closer to having a clearing house of knowledge, lists of books to read, online courses being offered for free or at a nominal fee, groups that get together socially for no other reason than to share that interest. Later, we can discuss the potential of boards, or groups on Facebook or Google+ in order to discuss those resources that we find. Whether any of us views it as a culture, a spirituality, a passing interest or even a fandom, it is my personal belief that none of us individually knows nearly as much as all of us do collectively. It is also my belief that if we try we may yet make even more of our dreams about Kemet come true. The eye has served as a powerful image for humanity for millennia. The Eye, in Kemetic belief, centres around the Udjat Eye – which is that of protection. Also the Eye of Heru (Horus is his Greek name) and the Eye of Ra – which are separate entities from Ra’s more than 70 forms – and can function independently of him. Even in the earliest periods of Ancient Egyptian history and culture , the sun and the moon were often regarded as very eyes of the Great Falcon, Horus. Later the two were differentiated in that the Eye of Horus was the Left Eye or the Moon, while the Right Eye was Ra or the sun. One particular myth which comes to us from the tomb of Tutankhamun, talks of how Horus’ eye was blinded but then restored by Hathor – who is Herself an Eye of Ra. This ties into the cycles of the moon and of the waxing and waning action of that heavenly body that is ever present above us. The more well known “Eyes of Ra” are HetHert (Hathor), Sekhmet, Bast, Wadjet, Mut, Meretseger and even Aset (Isis). 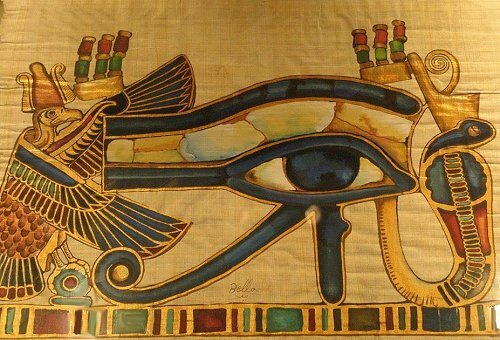 The Eyes of Ra were considered to be the protectors and enforcers of divine law. Probably the best known myth surrounding this is the “Destruction of Mankind” where Hathor, the goddess of love, beauty and all that is good is told that Mankind has rebelled and attempted not only to overthrow the Netjeru (gods) but destroy them utterly, is sent forth by Ra in order to punish them : Thus Sekhmet was born. These goddesses, known as Eyes also resided in the crown, or uraeus that was upon the brow of royalty. These goddesses held the power of the King and their power is manifested through him. This is where the function of the Queens or Great Royal Wives were the stand-ins for the Eye Goddesses, such as Hathor and Isis and insured the protection of Kingly Power and function within the Two Lands. The Eye of Horus, or Eye of Ra or Udjat Eye were all a part of this greater protection. There were almost always eyes included within funerary equipment in the form of amulets, and painted motifs on coffins, walls. The Eye was a major theme to protect not just the pharaoh, but common people as well. It worked to keep away evil, to insure the path toward the Afterlife of the Duat was kept clear. The sailors of Ancient Egypt would often paint the eye on the prow of their ships and even skiffs to insure safe travel. Even today, modern Kemetics will have Eyes either painted on their vehicles, or in similar fashion to the Fish motif of the Christians, they will have an eye on their car. I certainly have them on all of our vehicles. The Eye as depicted in Ancient Egyptian art is based off of the markings of falcons, such as the Peregrine Falcon ( Falco peregrinus ), a totemic representative of the God Horus. As depicted on many Eye artifacts, whether it be an actual amulet, piece of jewelery or a painted motif, shows the “teardrop” marking near the bottom of the Eye, not dissimilar from the markings on the Peregrine falcon. A similar line is also found just below the eye of the African Cheetah, who at times can be taken to represent Eye Goddesses that take the form of big cats. Hieroglyphically, there are several symbols for the Eye. Gardiner Sign list, symbols D4 through D17 either depict the Eye or parts of the Eye. The attached meaning in Ancient Egyptian to these often talk of “doing” or “making” or one who “makes or does”. This idea ties rather emphatically to the eye and what it symbolizes as being an active rather than a passive role. “Here comes protection”, or “The Eye goes forth”, which could be in a protective or punishing type of function. The Eye of Ra is there to protect and to defend authority and keep the balance and either defend or restore ma’at. The Eye is also used symbolically within Ancient Egyptian mathematics as a sort of symbolic break down for the concepts of measurement in the form of fractions. 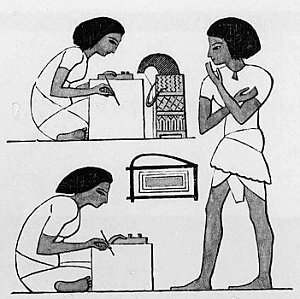 The Rhind Mathematical Papyrus and the Lahun or Kahun Papyrus, both have tables of unit fractions (1 as the numinator), and scribes would often have these tables for use within their work. Unfortunately, however, studying this particular diagram does nothing for those of us who are mathematically impaired, no matter how much we love all topics that pertain to Ancient Egypt! Another symbol of the Eye of Ra in specifics is the sun disk that appears on the heads of solar deities in the Egyptian pantheon, such as Sekhmet, Horus, and even Ra Himself. The sun disk and the Uraeus at the centre were protective and punishing at the same time. The sun or Ra moving across the sky could be found in the symbolism of the Solar Barque, which carried Ra across the sky each day. 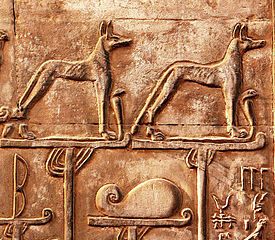 In the Barque of Ra or the Solar Barque, other deities rode with Ra. Certainly the body of the heavens was equated with the Celestial Cow who travels with Ra. The symbolism of the Eye is central to Ancient Egyptian belief and the complexity of everything this one symbol can encompass can be both complex and at times confusing. While the Eye was a protector, it was also a punisher of wrongdoers. While it was protective of that order or Ma’at, it was sometimes difficult to control and would tend to wander. The cycle of the Wandering Eye returning to the Two Lands to signify that balance would once again be restored was met with great joy and merrymaking. When the Eye is restored and reestablished, we, too, are likewise restored and reestablished as well. Shaw, Ian, and Paul T. Nicholson. The Dictionary of Ancient Egypt. New York: Harry N. Abrams, 1995. Print. Wikipedia, “The Eye of Horus”. Web. After a great deal of thought, I am going to be switching some things over with this blog. I will be keeping the name, fannyfae.com, but I have another domain, NiankhSekhmet.com (Life Belongs to Sekhmet). It is my Kemetic name and it would probably be much better if all of the Kemetic related posts went to live there and the fiction, herbal, writing businesss and other types of posts will remain here. Of course, I am still working on a new banner for the site, even if the wallpaper is a bit familiar. In short, the work for both blogs will be more specifically focused. So pardon my dust and I do some rearranging. I promise to keep everyone posted. It gives me the opportunity toward more specific types of branding in posts. I know that one will be for the ebooks and business while the other will be more personal. So look for this space to change a bit over the next few weeks. No doubt I will be doing the same over on Tumblr, Twitter, Facebook, Google+ & etc. If anyone needs to reach me, they may do so here or can write me at fannyfae at gmail dot com. Yesterday (February 4th), marked the day that Sekhmet calls to Her shemsu (Followers). Last night I celebrated a rite to Sekhmet with heka, meditation and prayer. Offered before Sekhmet’s naos was ight, incense and pomagranate liqueur. It was a time of re-dedication and reflection on numerous goals and areas of personal focus. I was able to write some heka for the day which I will share here. This is only one part of the Rite. The other parts are either Oathbound or are not going to be published until the Sekhmet book is released. Nothing and no one shall disrupt my peace. Nothing and no one shall disturb my peace. Nothing and no one shall destroy my peace. I am the daughter of Sekhmet-Mut, daughter to the Queen and also to the King! My birthright is that of the lofty and high. All the Netjeru know my name! I do believe that this date, not accidentally, falls just one day before the Uncreated One, [Apep] is brought into existence on February 5th, according to an Ancient Egyptian Festival Calendar that I assembled years ago. I rather buried it even before I switched ISP’s and now it rests on the website that I am co-owner of, PanHistoria.com. 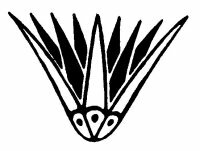 In reflection, it occurs to me that we, the shemsu of Nejter, are called to right to uphold Ma’at and to do what is right around us and what is within our power to do, even if that ‘right’ is merely getting our lives straightened out and all things working and in order. While that sounds like something that should be second nature for all of us, somehow in the process of living we put off, we shirk, or we pretend not to see what we know in our hearts must be done in order to preserve ma’at. At any rate, I have a number of dates for various Sekhmet and HetHert (Hathor) festivals that I am working with. It is my goal to continue these throughout the rest of the Kemetic year. I am not necessarily doing the same dates that my Sekhmet sister, Aubs is doing or exclusively from a list that Candace Kant has published from a number of sources that was recently posted on one of the Sekhmet groups on Facebook. To this list, which mirrors the one I already have, I have a few more of from my own research. Unlike Aubs, I am not currently focusing on healing rituals for others at the moment. The only exception would be for emergency situations, of course. My reasons for not offering to do the same types of ritual work for others is this: I have done the stint as an herbalist and healer for Sekhmet, often to my own detriment. I now have to be wise enough and experienced enough to know when it is time to take a step back and heal my own self and my life. No, that isn’t foreshadowing any sense of ‘DOOM’; however, it is nonetheless necessary. So both yesterday and today have been days of much reflection and planning and serious focus on both my online client work, school planning for next semester and the various publishing and filming projects. I admit, my shrines have been pretty much open the entire time with candles burning nearly on a constant basis. In the wake of the latest bits of cleansing and clearing, it feels as if a great weight has been lifted and much of the extraneous “junk” has been cleared away. It’s good to have that sense of being more organized and a sense of purpose. For too long I’ve been working on the agenda of others, and now it’s time to focus on my own. That alone has made the time spent very well worth it.